Mahanoy City, Pennsylvania, changed the way people watch television. In the early 1950s, as Americans embraced TV, Mahanoy City was left out. Tucked between mountains in the eastern part of the state, it could not receive broadcast signals from television stations in the big cities nearby, so a local appliance dealer, eager to sell televisions, placed an antenna on the highest point above the town and strung coaxial cable from it downhill into homes. Thus, was Mahanoy City, a town of just 11,000 people then, the first community in the United States to get cable TV. The reason for the town’s location was the anthracite coal that lay beneath those signal blocking hills, and while cable television spread across the country, the America’s need for anthracite coal dwindled and the town’s population along with it – just 4,000 people by the latest estimates. But if the economy faltered, the spirit of the community remains strong, and nowhere is that more apparent than in the Mahanoy Area School District. The sports teams – known as the Golden Bears – have a strong tradition of success symbolized by the trophy case in the high school lobby which displays the fruits of competition in football, basketball, softball, track and field, among other sports for both boys and girls. 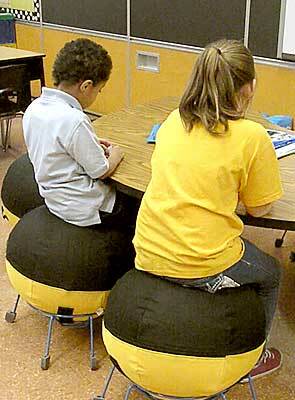 Innovation is alive in Mahanoy City schools where two Learning Support classes are equipped with AlertSeats. 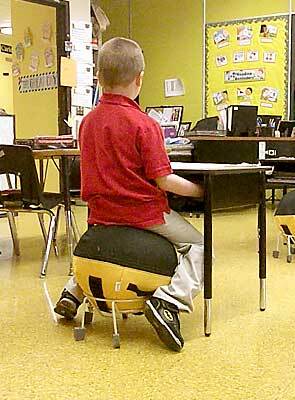 Students have the option of sitting on an AlertSeat or a conventional classroom chair. Most choose the AlertSeat. School pride is strong in Mahanoy City. AlertSeat covers in the school colors honor that tradition. 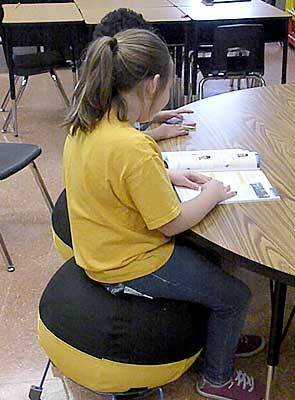 Innovation is still alive in Mahanoy City schools, too. Special Education Director Brandy Paul saw AlertSeats at an educational conference last year and decided that they should be tried out in two of the district’s Learning Support classes in hopes that they would help improve student performance. Enough of the devices were purchased to provide all the students in Colleen Fanelli’s K-1 class, and Adriene Kessler’s second grade the option of sitting on an AlertSeat rather than a conventional classroom chair. Once they learned how to use them, Ms. Fanelli’s students began to ask for them. 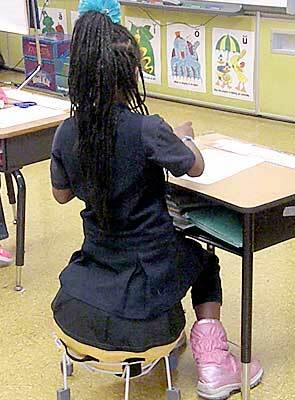 Two of her students prefer to use the regular seats, and that’s fine, she says. She says they are especially effective with behaviorally challenged children. All of Ms. Kessler’s students use the AlertSeats in her classroom, but she points out that students need to learn how to use them. Molly Neifert, an occupational therapist who works with the children agrees. Providing the best for children in special education is a constant challenge, according to Ms. Paul, and she manages her budget carefully to be able to try innovative ideas like the AlertSeats now in two classrooms. John Walson, the appliance store owner who brought television to the people of Mahanoy City and thereby changed the country, would agree with her approach.